Each year millions of taxpayer dollars from the National Institute of Mental Health (NIMH) go toward creating “animal models” of this uniquely human and complex psychological disorder. These experiments have received $1,415,706 since 2013 in taxpayer dollars, and the project is scheduled to continue until 2018. Such experiments are exceptionally cruel, designed to intentionally inflict great mental and emotional stress – including pain – on animals, to replicate traumatic events. Electric shocks are used frequently, along with surgically-induced brain injuries and psychotropic drugs. 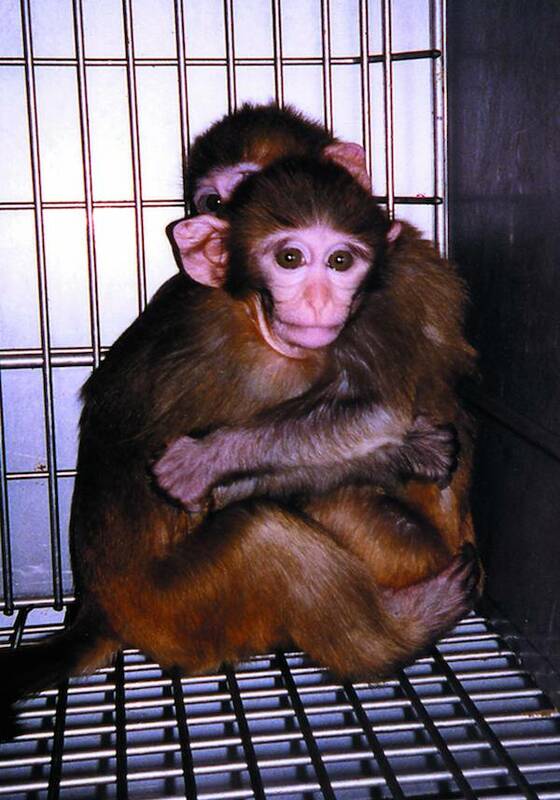 Tell National Institutes of Mental Health to oppose taxpayer funding for PTSD research on animals. Rising terrorist threats, escalating gun violence, and two exhausting wars over the past 15 years have left many Americans with deep emotional scars. As a result, mental health clinicians have had to confront the challenge of treating various manifestations of post-traumatic stress disorder (PTSD). Options for treating PTSD have improved significantly. The American Psychological Association, the Veteran’s Administration and the Defense Centers of Excellence all acknowledge that there are effective treatments, including targeted psychotherapies like cognitive-behavioral therapy, exposure-based therapy, and medications such as Paxil and Zoloft. Federally funded research at Georgetown University is using monkeys, supposedly to study the brain pathology of PTSD. Nine young and healthy monkeys between two and five years old had infusion chambers implanted into their skulls for injecting drugs directly into the brain. Shortly after receiving the drug bicuculline, all 9 monkeys showed abnormal behaviors such as cowering, recoiling, crying, attempting to escape, throwing objects, attacking toys by biting or hitting, and rattling cage bars. The monkeys who received the drug are later paired with another monkey who did not receive any brain infusions to observe their social interactions. It is reasonable to question what this scenario has to do with PTSD. The grant abstract for the Georgetown research explains this is done “to test further the role of these [brain] structures in socioemotional behavior.” Yet such an explanation is woefully lacking any reasonable correlation to human PTSD. In fact, a large body of evidence shows that over 90% of behavioral neuroscience experiments on animals fail to translate to humans. Despite that, the Georgetown monkey experiments are currently receiving close to a half million dollars each year through the National Institute of Mental Health. They have cost American tax-payers over $1.4 million since 2013 and are scheduled to continue to receive funding through 2018. Valuable human-relevant research into PTSD can be carried out using non-invasive neuroimaging, including functional MRI, providing up-to-the-minute, information on the living brains of PTSD sufferers. Such research under the VA Healthcare System and other U.S. institutions is producing useful information for understanding PTSD. Animal experiments to study PTSD are by nature artificial, reductionist, and in many cases downright ridiculous, were it not for the intense suffering they inflict on animals. Inevitably, they cannot and never will represent the reality of PTSD in human patients. It’s time they were ended.